My late father (z”l) was a special man – scholarly, pious, wise. A man whose eyes spoke of understandings unfathomable to me when I was young and whose strength and full impressiveness only come into clearest focus as I myself have gotten older. Parents are always something of a mystery to their children. Those parents who lived during the horrors of the Shoah often remained an ever deeper mystery to their children, as if the pain of that time rendered parts of them unreachable. It wasn’t until a few very short months before my father passed away that I began to truly unlock that awful past in his life. As I was going through his briefcase where he kept his most important and closely-held papers, I found a document written in Romanian, a language that I knew to be part of my family history but which I could neither read nor understand. I turned to my sister, Miriam, for help. Miriam, ten years my senior, had been born in Iasi. Romanian had been her first language. When I handed the document to her, she studied it closely. Her expression began to change. Her hand began to tremble. She dropped the document to the floor as her face became a mask of grief and tears sprang to her eyes. “Miriam, what is it?” I asked, troubled by her reaction. My sister had suffered throughout her life, tormented by unimaginable nightmares that robbed her of sleep and sanctuary. The document I had given her described her nightmares perfectly – skeletons tossed haphazardly to the side of the road, bodies hanging from lampposts, Jews driven to their knees, shamed in the public square. The document recorded the testimony of a survivor of the Iasi pogrom. It was not the fantasy of a nightmare she read in that document. It was cold, harsh truth. Miriam had been just three years old when the pogrom occurred but the images that the witness documented had been seared into her young imagination, returning in nightmares to torment her anew throughout her life. The “nightmare” had been real. Iasi was not the first, nor the last, of the pogroms visited upon Jewish communities throughout Europe during those horrible years. 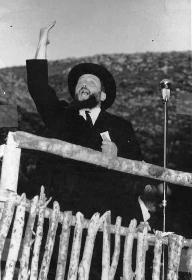 But Iasi was the community where my father was the Chief Rabbi. Iasi was his community and the community which, after three days of horror during which he was shot in the leg, his leadership was called upon as never before. The Jews had been in Iasi for over four hundred years in June of 1941. Established in the 16th century, the community was highly developed religiously and culturally, as comfortable with its Chassidism, and its Zionism, as it was with its Yiddish theater. Between 1930 and 1940, the Jewish population grew from approximately 30,000 to over 50,000. On the one hand, it was a perfect, inviting Jewish community. However, on the other, Iasi was anything but inviting. It was well known for its virulent anti-Semitism. Romanian fascists and anti-Semitic students had visited pogroms on the Jewish community in the past, in 1899 and 1923. The Romanian government never honored their obligation of the 1919 Versailles Conference to grant Jews citizenship. Jews were never safe there. However, for all the pain and hardship that the community had endured, nothing prepared it for what was to come on June 28, 1941. It was then, as the Axis prepared for war against the Soviets, the horror began. There had been rumors circulating for days, weeks, and months. False rumors promulgated by the authorities, lies that sought to deflect blame from the authorities and place it on the Jews for the difficulties of the war. Outlandish lies so preposterous as to be unimaginable. Lies built upon more lies. Lies that accused Jews of helping the Soviets in their bombardment of the city. Lies that were accepted and embraced in the non-Jewish community. It was coming. It seemed that all of Iasi held its breath, awaiting its arrival. And arrive it did. With a vengeance. A rocket was launched to signal the start. The rocket’s flare had not faded before death and destruction was visited upon every Jewish district in the city. The attacks had been timed to coincide with the movement of Romanian and German troops toward the Russian front. The troops, which had been moving silently forward, suddenly started firing at the houses from which they believed they were being attacked. Panic broke out. A “thorough” investigation into the event was ordered into the shooting of the troops. Though not a single soldier was found to have been killed or wounded, throughout the night Jews were randomly arrested and taken to a number of collection centers, most to the Police Headquarters. Throughout the night, Jews were dragged from their homes, from their beds, from their families, and brought to the courtyard of the Police Headquarters. By dawn on that Sabbath morning, more than two thousand Jews had been rounded up. By noon, the number was six thousand. June 29, 1941. Duminica Aceia (That Sunday). That Sunday. 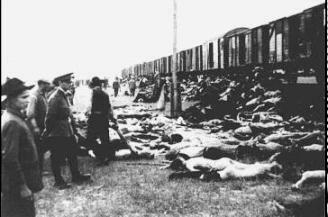 The bloodiest day in the history of the Jews of Romania. With the mass of Jews corralled into the courtyard of Police Headquarters, soldiers opened fire, killing several hundred even as other soldiers beat individual Jews to death. Did the screams and wails of these defenseless victims bring about mercy in the hearts of these good Christian soldiers? No. Their hearts were deaf to the defenseless cries of the innocents. Not just the soldiers. The community had exploded in a vile expression of hatred and evil. Even as the massacre was taking place at Police Headquarters, the pogrom raged like a wildfire throughout the city, striking terror in every Jewish home. So began the Romanian chapter of Hitler’s Final Solution. 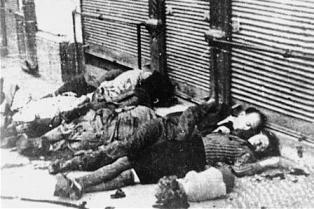 12,000 Jews were arrested and shot outside Police Headquarters. 4,300 more were stuffed into closed cargo vans and cattle cars on trains. 2,650 died of thirst or suffocation. There are those who might argue that those who perished were the “lucky” ones. The survivors suffered excessive physical and mental trauma that, as it did my parents and sister, would torment them throughout their lives. What does the spiritual leader of a community so horribly violated do? What does he say? What is the response to an attack so vicious that even a monster like Hans Frank refers to it as “butchery”? Only the pure flame of God’s truth could burn true in the face of such horror. Only God’s strength could remain unbowed. They said that when my father spoke, taught and lectured, flames of fire spewed forth his energy and dynamism. Many who had heard my father teach told me, “Whether there were three students in class or five hundred in a lecture hall, when your father taught, it was the same ma’amad Har Sinai – the same revelation at Sinai, as if sitting at the feet of a prophet” – nurtured and developed in the fires of destruction that came upon his community. My father, elected Chief Rabbi of Iasi at the young age of twenty-seven, had looked upon the fires of Hell burn his people. How could he rehabilitate his own life, let alone the life of his community? How does the leader of a community see its own destruction wrought in such brutal, unspeakable ways and go on? How does he lead? How does he even dream of renewal…? My father, in his three-volume work, Studies in the History of Jewish Education, noted that with such fear and trembling surrounding the community, the leaders of the community nevertheless – with the last of their strength – turned from siege and suffocation to rays of redemption. The past was pain. The future, as difficult as it was to see, held hope. “There was a need for great focus in the midst of orphaned solitude and overwhelming loneliness to think of revival …There was a need for all in the community to erect a damn in front of the storm that engulfed our very existence. The saga of endless pain and suffering which equally devastated young and old – also manifested great spiritual strength and fortitude. “The inescapable question confronting us was: in these horrific circumstances, how will we maintain our ancient and sacred heritage, our Torah and its practice? And the answer: We will renew the flames of hope in our hearts and rejuvenate our faith, through education, teaching and learning in schools and renewed Tefilah. The lesson of Iasi? To continue to teach. To teach, to teach, to teach. In Torah, there is rejuvenation and rebirth. In the soul of the Jew is great strength. My father was one of the very first scholars to research, study and publish about halachic issues and Shailos during the holocaust.